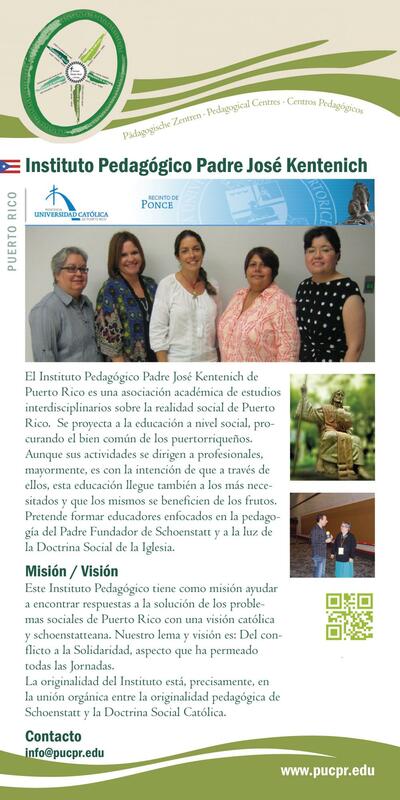 The Pedagogical Institute Fr Joseph Kentenich is an academic combination of inter-disciplinary courses adapted to the social background of Puerto Rico. The Institute adjusts its educational programme to the social niveau of the country in order to promote the common good. Although the courses are aimed at professionals, the intention of the Institute is that they should reach the less fortunate of the country, so that they can profit from them. The Institute aims to give the graduates an intensive training in the teaching of the Church and Fr Kentenich‘s pedagogy. The vision of the pedagogical institute is to find ways to solve the social problems of Puerto Rico against the background of a Catholic and Schoenstatt vision. Our motto: “From conflict to solidairity“ has inspired every aspect of our conferences. The special character of the Institute is to be found precisely in this connection between Schoenstatt‘s pedagogical starting-point and Catholic social teaching.